Learn how the simple yoga strap can help you experience the full benefits of the yoga pose, by extending your reach and making you feel more secure. I have gone to many yoga classes in my lifetime. In every studio there is a shelf full of yoga straps, yoga blocks and other yoga props. The mysterious shelf often beckoned me, mostly because I was curious. However, I never really paid much attention to the yoga props calling me. I suppose this was because I was never taught how to use them. Could this be so? I actually felt I was too "advanced" to use them! 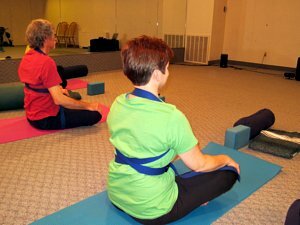 It wasn't until I went to yoga teacher training, that I finally got to learn how to use the lowly, inexpensive yoga strap. Just like in my experience with wall yoga, it was a great revelation for me. For what I know now, it is the best yoga prop that should be used by a lot more folks. I hope that you follow along with me and see what marvelous things that can be done with a strap to support you and your yoga practice to receive the full yoga benefits. You can receive these yoga benefits no matter what level you are at currently. The yoga strap will just make it easier for you. It extends your arms and therefore your reach, making it easier to get a great stretch without straining yourself and while keeping your spine in alignment. Using yoga straps is a way to experience the fullness of the pose without compromising the integrity of your spine. The yoga strap is often used in a loop. It can help to stabilize arms and legs when you need to hold a pose for a while. It also helps with the proper alignment by keeping your arms or legs together. You can also use the strap to offer resistance to make the pose even more challenging. Something for everyone! 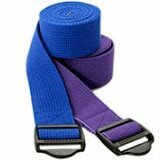 If you need a yoga strap, there are many types to choose from. Just Click Here. If you are short, the 6 foot one will do. If you are over 6 feet tall, I’d get the 8 foot one. 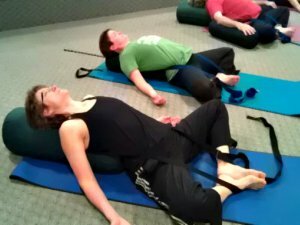 In my yoga class, I tried out all I had learned about yoga straps. Well, maybe not all, but most. They were very cooperative students, and I hope that you can learn from them. One student even requested to borrow a strap to take home so she could "play with it." I guess she enjoyed what could be done with the strap very much! The first thing we tried out with the yoga strap was correct shoulder posture. So many of us suffer from slumping shoulders, creating a hunchback with a forward head posture as we age. In order to find good shoulder posture that should be held in most if not all yoga poses, take the yoga strap, place it around the back of your neck so the two straps are in front of you. Next, wrap the ends under your armpits, around to your back. Cross the straps in the back and bring the ends back to the front. Secure and tighten the buckle in the front. Do it tight and securely enough to fell a pull back on the front of your shoulders. 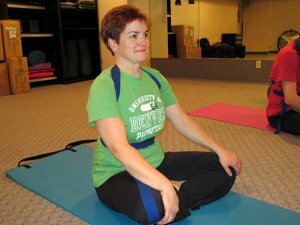 You can wear a yoga strap while you sit at your computer desk as you work or around the house to remind you of a correct shoulder posture. It works great! The next beginner yoga pose we tried was the Cow Face Pose shown next. This one is very difficult if you have tight shoulders. None of the beginners in the class were able to touch their hands together, behind their backs, so the strap extended their reach. Interestingly, when they switched arms, several could reach their hands on the other side. Another very easy beginner yoga pose and therapeutic pose is the Seated Forward Bend. Most people, especially men, like my husband in the first picture below, have very tight hamstrings and can't bend very far. But he is able to experience this pose, and the full yoga benefits by using a yoga strap. If you do this pose and are tight, make sure you keep your knees on the ground. Don’t pull so hard that your knees pop up. Keep your upper body straight and tall with your chest out. The goal is to feel the stretch in the back of your legs, keeping your spine straight, NOT to touch your toes. Everyone tries to go as far as they can and as a consequence they compromise their form. The same is true for the Seated Hand to Big Toe Pose. 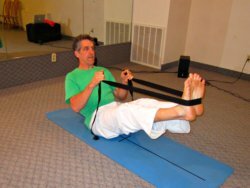 The strap extends your reach if your hamstrings and/or your hips are tight. If you can do this pose without a strap, holding your big toe with your "peace sign" fingers, great for you! The Boat Pose is another great pose for the beginner, using a yoga strap. It is relatively self-explanatory, if you look at the next two pictures. Even if you are not a beginner, but you have tight hamstrings, this pose feels great. There is something about the strap that makes you feel more secure, enabling you to experience the full yoga benefits of this pose! Keep your chest lifted, your core engaged and your back straight or slightly arched. Avoid the tendency to round your back. My step-son Alex is more flexible and has a great Boat Pose. His Dad, is much less flexible but he can experience the full benefits of this pose with the use of the strap. In order to have great form he just can't raise his legs as high. The Tree Pose is a hard beginner yoga pose. 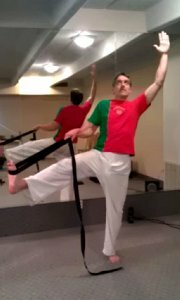 We tried the pose with a strap around the waist in a loop, and bending the leg, placed the foot through the loop as well, like shown in the picture. I had them stand up against the wall, or holding on to the wall, whichever they preferred to get themselves into the loop of the yoga strap. This way if they lost their balance, they wouldn’t fall over. The experience of the Tree Pose with a strap is much different. You no longer have to concentrate on holding your leg up, so for most, you can hold the pose much longer, and get the yoga benefits of the standing balance. The pose that everyone loves is the Dancer Pose. While I would not classify this as a beginner yoga pose, when done with a yoga strap, it becomes one. If you learn the Dancer Pose with a strap first, your body will understand the feeling of the pose when you are ready to try it without the yoga strap. You may wish to try this one first with the wall close by. Begin by standing on two feet, placing the yoga strap around the arch of your foot, holding both ends of the strap in each hand. Cross over the straps (exchange the strap ends to the opposite hand) so that the cross is over the top of your foot. Then with the other foot that is not strapped, step through the loop that is created, like a jump rope. Your strapped foot is now behind you, with your hands back, just like you are going to jump rope. 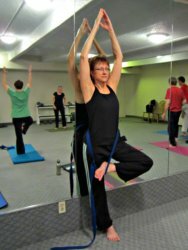 With each end of the strap in your hands, pull your foot up as you bend your arms and lift them up and behind your head! If you can still balance, lean forward as well! The Downward Dog Pose is not a difficult pose. Doing it with good form is a bit harder. In order to feel this pose as it is meant to be, it will take two yoga straps and two people. Make a loop out of one of the straps, and place the loop around your legs, just above the knees. (It is difficult to see the strap above the knees in the picture to the left, due to my client's dark pants). Make sure the loop is just wide enough to allow your feet to be hip-width apart. 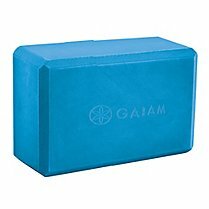 This will support your legs and keep them together. Now bend down into the downward dog position. The second person, stands behind you with her legs between yours. She places the second strap around your back, starting at the top, and then winding each end around each side of your waist toward your belly button and back between your legs. With both strap ends now between your legs, she will lean back and pull on the straps, as you exhale. This will pull your hips up and back, taking the weight off your hands and shoulders. It feels incredibly supportive, and you can get your hips up high in the air and get the full extension of the pose. This helps you experience the full yoga benefits of this pose! Wonderful! The Standing Hand to Big Toe Pose can be experienced by even the people with the tightest hamstrings if you use a yoga strap. My husband who has the world’s tightest hamstrings doesn’t look too bad in this pose, despite the fact that he can’t raise his extended leg very high. I just wish I could get him to relax his shoulders and breath into this pose more. But he is such a great sport and a true beginner! He is definitely experiencing the full yoga benefits by learning to balance on one leg, stretching his hamstrings and attempting to find relaxation in the effort. The relaxation into the action of the pose will come later, I am sure! He has already come a long, long way in just a few weeks of practice. Everyone loves the Hammock Pose. It is an extremely easy beginner yoga pose and extremely relaxing and restorative for anyone at anytime. 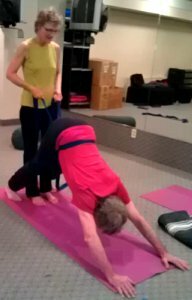 Begin by making a large loop with your yoga strap. Lie down on your mat, on your back. Being very careful to place one end of your loop at the base of your skull bones, NOT your neck, bend one knee as you curl up and place the other end of the loop around the ball of your foot. Relax back and let your head support your leg as you straighten it out. The loop creates a cradle with counter-pressure from your head to your foot, which balances and supports you in the pose. It lengthens your leg and gives a gentle stretch to your hamstrings. Do both sides for as long as you feel it! I love to stay in this pose for a long time. It is so calming and de-stressing! Try it ~ you’ll love it! The next lying pose is again on your back. This is a Lying Leg Crossover with a strap. With your left knee bent and your right leg extended, place the yoga strap under the ball of your left foot, and lie back on your back. Grasp the ends of the straps with the opposite (right) hand. As you inhale, raise and pull your left leg straight up in the air with your strap, perpendicular to the floor, as shown in the picture below. Exhale and pull your strap to cross your leg over as shown in the picture below, keeping your left shoulder on the ground and your left arm out as shown. Breathe and stretch into this twist. Hold for as long as you like. Inhale and pull your leg, back up perpendicular again. Exhale, switching your hand to the left hand, pull your leg out to the left side, keeping your right hip on the floor. Breathe here and hold this as long as you like. Inhale your leg up straight in the air again and bring it back to the ground. Repeat the same sequence on the other side. This is a wonderful twist/stretch and will leave you feeling invigorated. Always do both sides for equal amounts of time, for balance, even though only one side is pictured. The Raised Feet Pose (Legs in the Air Pose) is a simple inversion that invigorates you by increasing the blood flow to your upper body and head. We rarely raise our legs up in the air, and it is very therapeutic. The yogis believe that this pose will cure just about anything that ails you and will keep you young. It is a lower back release as well, so if you carry a lot of stress in your lower back, do this pose for 5-10 minutes several times a day and you should see improvement. It is possible to do this pose without the strap, but it is much more relaxing to do it with it. If you can relax your shoulders, neck and upper arms while you do this pose it is even more beneficial. The final pose that I will show you is the restorative Bound Angle Pose using a yoga strap and bolster. Begin by sitting in the Bound Angle Pose, upright with your feet together at the bottom and your knees spread open. Make a loop with your yoga strap and place it around your waist. Make it tight enough that you can loop it around your feet in the bound angle position, but not too tight to make it uncomfortable. With a yoga bolster or pillows behind you, lie back. If you wish, you don’t even have to use the pillows if this is comfortable for you. Turn the palms of your hands up to receive more energy. Breathe and sink into the pose and allow your chest and shoulders to open up. Hold this for 5-10 minutes or for as long as you wish. It is very relaxing and restorative! This pose may feel like a vulnerable pose to you. If so, just cover yourself with a blanket to feel less exposed and more secure! If you do these poses in the order which I have given them to you, you will have a complete Yoga class with a yoga strap! Remember to breath into the poses, like I taught you in Beginner's Yoga. May your path to health and healing be enhanced by your learning these yoga poses with a yoga strap! Namaste on your journey!